YANGON — With Parliament’s approval Wednesday of a committee to draft amendments to the Constitution — by a vote of 414 to 191 with six abstentions — the efforts of the National League for Democracy (NLD) to democratize the charter appear to be on their way. It was the ruling party’s first official attempt at amendments since taking office in 2016. 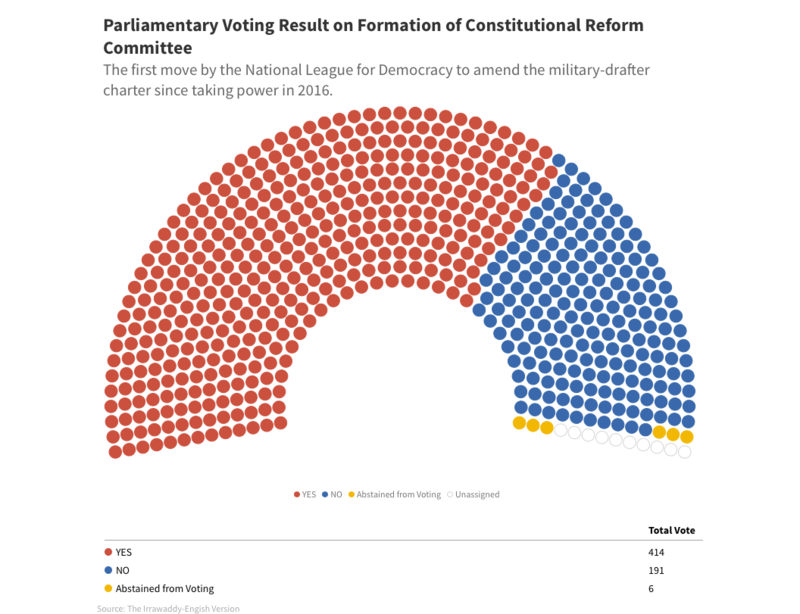 Drafted in 2008 by the then-ruling military junta, the Constitution reserves 25 percent of parliamentary seats for military appointees — just enough to veto amendments — and has been widely criticized as undemocratic. 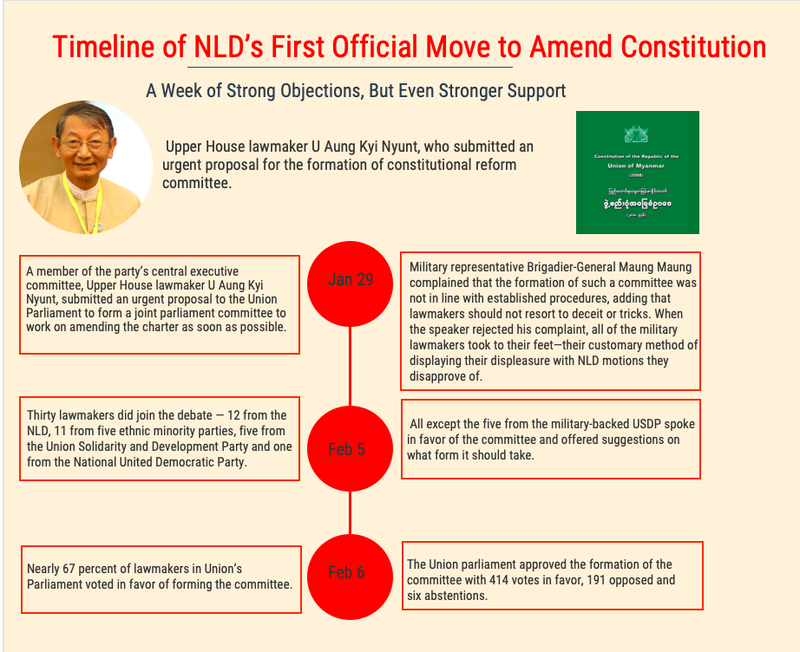 NLD lawmaker U Aung Kyi Nyunt submitted a proposal to form the joint parliamentary committee “as soon as possible” last week, drawing strong objections from the military appointees and lawmakers from the military-backed Union Solidarity and Development Party (USDP). On Tuesday, 30 lawmakers joined a debate on the proposal. 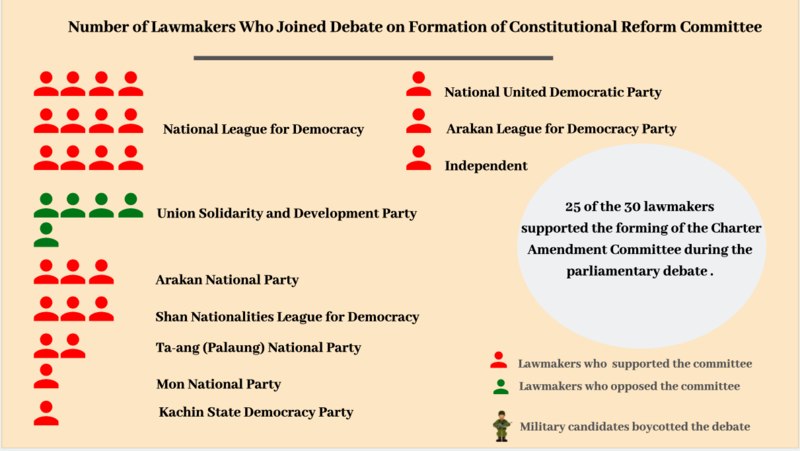 All but five — all of them from the USDP — spoke in favor of the idea, especially those from the NLD and ethnic minority parties. It was a week of strong opposition but even stronger support for constitutional reform in Parliament. Here, The Irrawaddy breaks down the committee’s path to approval in graphics and numbers.